Originally posted on 11/1/09 for the Charge of the Write Brigade. I sit here typing my article, my legs numb and my flesh sore. The only reason my stomach doesn’t ache is because I’m too tired to walk to the freezer to get any candy. If I allowed gravity to win and dropped to the bed, it would be the morning of November 1st before I could open my eyes. Am I complaining? No. Actually, I’m smiling. I’m going to stay up, watch something spooky and fun, eat some sweets and totally love the fact that this night falls on a Saturday this year. I love Halloween. Absolutely adore it. This year we walked a couple blocks to the main street Trick or Treat thing. All the businesses along main hand out candy and give off a neighborly feel at a time when small town friendliness is a thing of the past. We then went to a “Trunk or Treat”. Here in Utah various members of my church park their cars at the church parking lot, open their trunks and hand out candy. They do this, seeing it as a controlled environment so that kids are off the streets. Its fun and a chance to visit your neighbors. After that we went to dinner, and then knocked on a block of houses, gathering more sweets. For the last month, whenever I’ve passed two houses decorated to the max during the nightly dog walking, I'd swear to visit them. One had blinking lights set to music. A vampire glowed to the tune while smiling from its coffin. A tombstone reads “Here lies the last dog that pooped on my lawn” as a werewolf glares from behind. 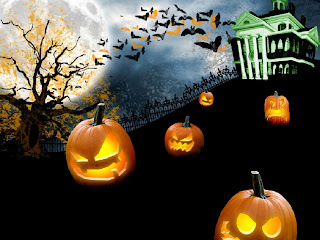 Pumpkins flash, a ghost wails as it travels down a wire and various ghouls grin at any visitors who dare hunt for candy. The yard resembled a fun house set to a Haunted theme. More kiddie than scary, I found it very fun. The other one had a different, yet equally enjoyable effect. Skeletons stood around an eerie graveyard. 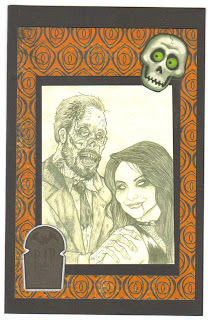 Some played cards on an over turned barrel while another bent on one knee and purposed to his ghoulfriend. A giant spider crawled down from the roof while a demon lurked in front of the red-lit basement window. All was lit with a strange, soul eating green light as if the other side ripped open, setting free it’s dark citizens into our world for the night. My mind raced with ideas for that one. 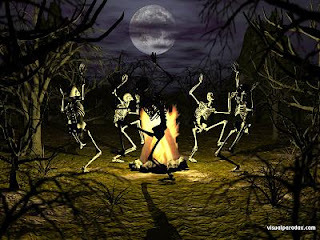 How will the skeleton army look when Roland or Annabelle command them in later books? Will there be any giant spiders when Ann visit’s the Arachnid’s kingdom in the 11th book? What strange colors and creepy feelings will accompany the unusual events in these later stories? Now we’re home, relaxing and resting. Halloween was a success once again. My creative brain is buzzing with even more worlds and situations to make life a unloving Hell for Ann and her brother. What about you? What seasonal events inspire you? *Update: In Halloween '10 it rained and we ran a bit late. Regardless it was a good evening. Halloween '11 just finished. We did all the things mentioned above and had a good time. I hope all of you had great Halloweens as well.